After 3792 votes, Team Helfand are the 2014 USC Slate. Team Belman scored 1933 points. Certainly not a close vote in the least, but then again, neither were the FIMSSC election results. The closest race in this year’s elections, in fact, were for the proposed health plan service enhancement where a vision plan would be added. You can read more details, and the full results of the elections here, but the majority of students (2766) voted against the enhancement. 2733 students, on the other hand, voted for it. I will say that at the results night, there was a cheer from the audience when it was learned an extra $30 wouldn’t be added to the health plan. 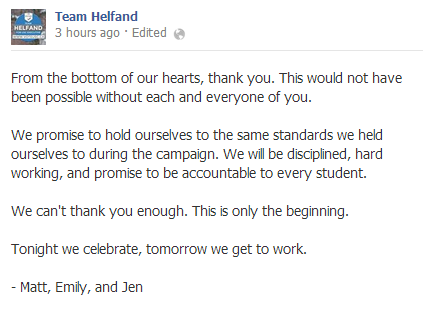 Team Helfand thanked their voters in this post on Facebook. Team Belman also congratulated the winners. It’s good to see that both teams are pleased with the results. While there was some overlap in their answers during the VP debates, and specific aspects each team disagreed on, it was clear each slate cared about helping their fellow students. As noted in my post about the FIMSSC Elections-particularly by Kevin Chao’s comments-however,there was a clear indication of student apathy. Helfand noted in the media debate that he felt even less students would vote this year from 2013, because there were two slates instead of three. 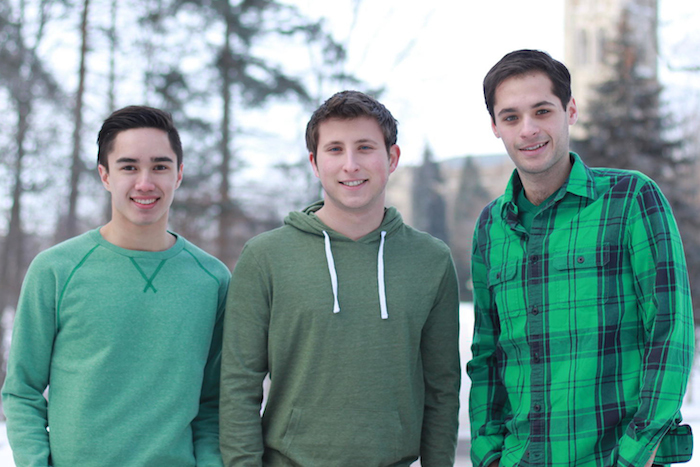 Belman also noted during the VP debates that he had a problem with student apathy. There was even a bit of that in the results show. Sure, there were quite a few people filling up the seats set up, with a few standing off to the side of the room, but still just a small fraction of the Western University population. Mind you, there are likely a number of people who voted but couldn’t attend. 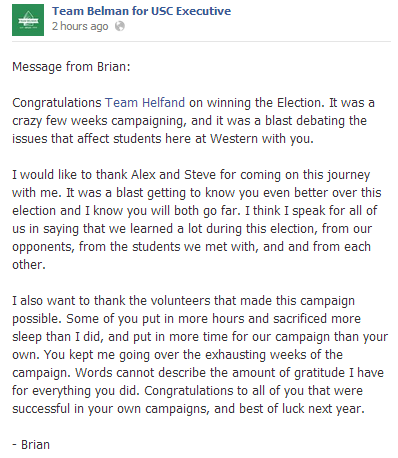 Either way, Team Helfand and Team Belman both deserve a congratulations for their run during the campaign, as well as anyone else who ran a position. 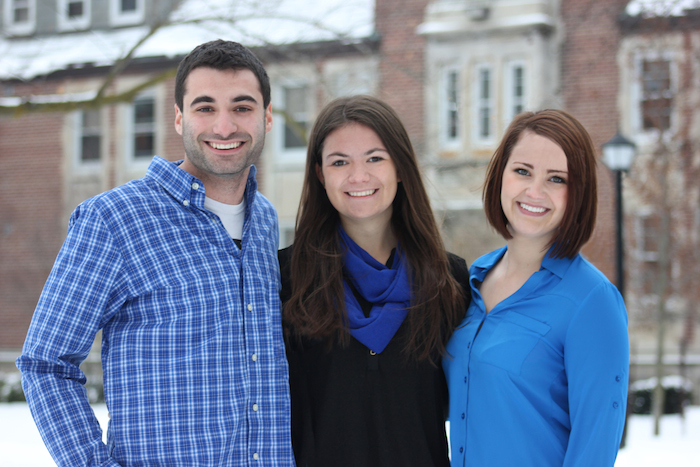 This is the second year of the slate system, so Team Helfand has an idea of what to expect during their run; though they appeared confident throughout the campaign. Do you have anything to say about the results? Comment below.